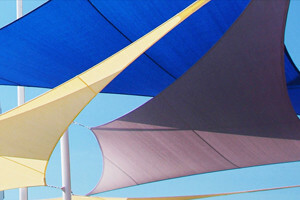 Shade Sails are an artistic canopy that provides sun shade and UV protection for, playgrounds, swimming pools, backyard patios, and other outdoor living spaces. Tenshon manufactures standard and custom shade sails from shade fabric, in the United States, and distributes them worldwide. Shade sails, also commonly known as sun sail or sun shade sails, are an excellent alternative to a pergola, gazebo, awning, or patio umbrella. The inward curves along the sides of each shade fabric panel are indicative of shade sails and are engineered to help spread and distribute the tension placed at each connection point evenly over the entire sail. The result is a sail shaped sun shade capable of providing functional shade in an iconic architectural form. When planning a shade sail design, you have to consider the angle of the sun and where the shadow cast from the shade sail fabric will be located. 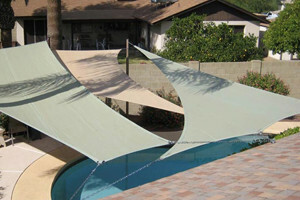 Shade sails should slant sufficiently as to prevent water from temporarily pooling during rain. 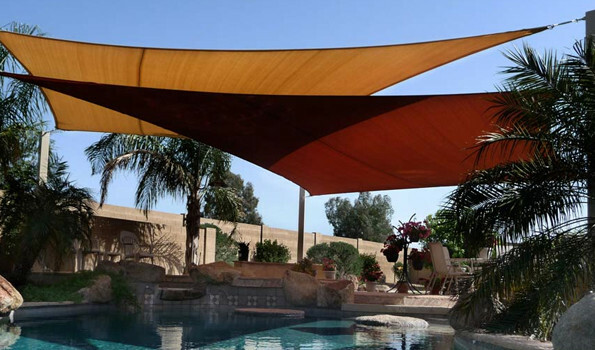 Shade sail structures will keep your swimming pools, spas, entryways, outdoor patios, and parking structures cool in the Arizona heat. By lowering ambient air temperature, shade sails reduce your property’s cooling costs and save you money. As outdoor shade sails require no energy consumption, they present an affordable, environmentally-friendly solution for your property. 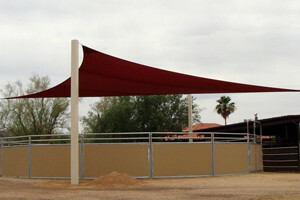 Available in a wide range of colors, styles and shapes, each shade sail is custom made for the area that will be covered. Typically supplied in shape of squares or triangles. Shade Sails can add a modern style to any area, and can be completely customized. 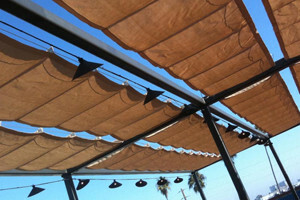 Shade sails can also be made into umbrellas, structures and Roman shades. Like our shade sail products our roman shades also provide artistic and functional shade from the sun. Unlike our shade sails, the roman shades are suspended from two parallel cables. They provide a more traditional shading experience and are capable of opening and closing to create a more transitional space. They are a great addition to other patio sun shade products like pergolas. The Fabric is made from extruded and UV stabilized high density polyethylene (HDPE) monofilament and tape yarns. The fabric is constructed by knitting together the monofilament and tape yarns using a ‘raschel’ lock-stitch pattern designed to significantly reduce the spreading of tears/cuts. The entire finished textile is then heat stentered to help reduce shrinkage and creep over time. The fabric is mold resistant and waterproof however the ‘mesh’ pattern creates small gaps in coverage which allows some water to pass through. Layering and sloping can successfully improve water deflection and rain shed. The advantage of having gaps in coverage is that it allows warmer air to rise through the fabric, helping to reduce the temperature below.